HSBC slapped on the wrist for laundering money for Al Qaeda and Drug Cartels-click here! In a Senate hearing this week, Elizabeth Warren grilled a Treasury official about a major Wall Street bank (HSBC) that was caught laundering money for Al Qaeda and drug cartels — repeatedly — and only got a slap on the wrist. 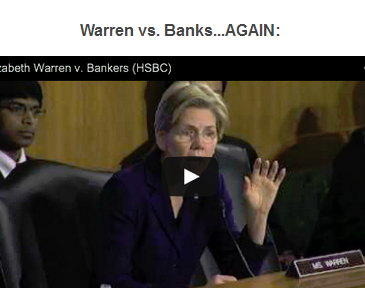 In the video, it’s clear that bank regulators aren’t used to being told to go harder on the banks. This is why we worked so hard together to elect Elizabeth Warren! "If you’re caught with an ounce of cocaine, the chances are good that you’re going to go to jail…but evidently if you launder nearly a billion dollars for drug cartels, your company pays a fine and you go home and sleep in your own bed at night. I think that’s fundamentally wrong."